is not really how it works. in last winter’s coat pocket. You are also not lost. your beliefs about who you are. is actually returning to yourself. before the world got its hands on you. In the last 18 months I’ve spent over 200 hours coaching women from socio-political and ethnically diverse backgrounds, on their mindset and emotional wellbeing. What I’ve noticed above all else is how we are united in our shared experiences of self-doubt, fear, guilt, shame, feeling unworthy and/or not good enough. When ignored or suppressed, these thoughts and feelings can hold us back from fully stepping into our power as women. But when we acknowledge and process them, we begin to understand the insights they hold for us and discover the keys to our inner transformation. 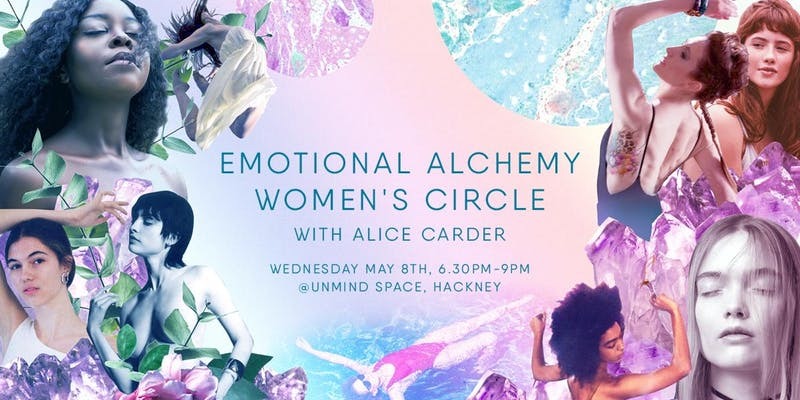 The Emotional Alchemy Women’s Circle is a supportive and non-judgemental space where we gather to experience healing in deep connection with ourselves and each other, through transformational practices and the alchemical conversation of women. A space where we can let go of old stories and patterns and begin to transform ourselves, creating a powerful new paradigm of sisterhood, community over competition, love, joy and liberation. Places are limited as UnMind is an intimate and lovingly curated space, so book your place early if you’d like to join us. A tiered pricing structure has been offered to welcome all women. Please choose the ticket that most accurately represents your current circumstances. Know that if you choose 'Supporter' you are enabling us to offer this structure and playing a key role in making sure our circle is rich in diversity, so that we can all learn from and connect with each other. Our circle is open to anyone identifying as female. Alice Carder AKA @theselfevolutioncoach is a Transformational Coach and certified EFT Practitioner who empowers women to stop playing small and step into their true power. Alice creates safe spaces infused with love and held in ritual, where the constraints of every day life are left at the door and we are free to BE. “Instantly I felt safe to share, and open up about things I wasn’t even aware I was carrying. This lady changed my life, and she can change yours. I have met so many coaches, but Alice has something so profound and safe. She will help you step into your true nature.” - Rachael Grimes, workshop participant & 1:1 coaching client. “Alice is one of those people that has an astute awareness of everyone in her company. She has the ability to emit pure love, thus making others confident enough to step into their own light.“ - Kate Francis, workshop participant. “Alice has walked the path of personal transformation herself and can support and inspire you in your journey.” - Shannon Jones, 1:1 coaching client.